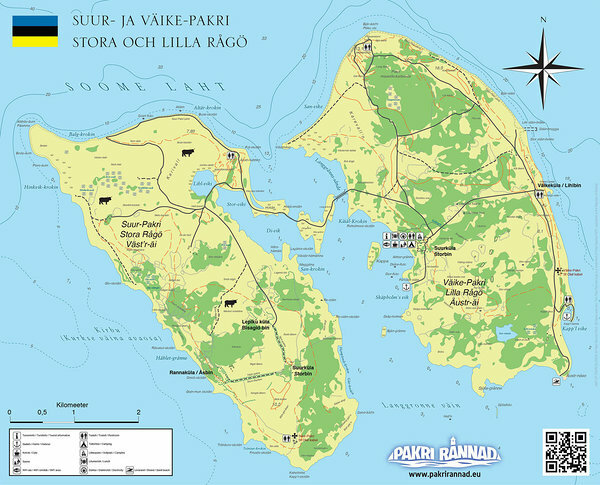 Pakri Islands are located 50 km west of the capital Tallinn, in eyesight of the old port Rågervik, Baltischport or todays Paldiski. Pakri Rannad is active in landscape recovery, ecological farming as well as the folklore traditions, architecture, music, dances and history of Pakri islands in Estonia. Suur Pakri and Väike Pakri has been inhabited by a Swedish minority since at least 1345 when five Swedes bought Suur Pakri from Padise monastery. The Swedish population was around 400 persons in the 1930:ths located in five villages on both islands. The Soviet invasion and communist ideology principally eradicated the Rannarootsi culture in Estonia and due to strategic location of Pakri islands to the Red Army the islands was completely emptied by its inhabitants in 1940. Most of the Pakri swedes went back to their old homeland Sweden. During the Soviet time the islands where a closed military zone and a shooting range for airplanes, ships and battle tanks. The open landscaped was slowly covered by bushes and trees, no animals was grazing on the ancient fields and the only thing that prevented the islands from being completely over grown was the constant forest fires after artillery and airplane bombings. After the collapse of the Soviet union in 1991 the life could return to the islands the wounds of communism could start to heal. Today we are back. We are running a cattle ranch with free grazing Hereford and Highland cattle on both islands. We farm the land again, repair the roads, build houses and restore our churches. Our values are based on old Estonian and Swedish farming traditions in combination with modern ecological principals. We are proud and grateful to continue the work on the islands and to produce high quality food for the Baltic Region as well as preserving the old historical agricultural landscapes and traditions for the future. Our company's small craft can accommodate 9 passengers. The length of the trip depends on the number of passengers and the choice of the port. Our proud vessel is a small craft called STORM JANNE. Pork, beef, chicken and lamb products. We offer soup, stew and delicious steak. Coffe and cake can also be prepared for you. We can also find a suitable solution for vegetarians. But you should inform the cook in advance. We offer an incredible experience to take a trip around the island or even on both islands. Instead of walking we can accommodate up to 20 people in the traktor wagon which allows us to travel without problems on both islands and on different landscapes. If you want to have a genuine experience in your life then this is the place to come.